Managing risks related to OSS adoption is a must for organizations that need to smoothly integrate OSS-related practices in their development processes. Adequate tool support may pave the road to effective risk management and ensure the sustainability of such activity. 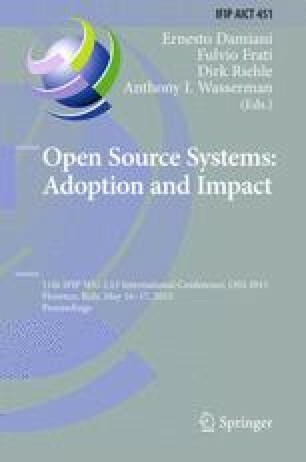 In this paper, we present the RISCOSS platform for managing risks in OSS adoption. RISCOSS builds upon a highly configurable data model that allows customization to several types of scopes. It implements two different working modes: exploration, where the impact of decisions may be assessed before making them; and continuous assessment, where risk variables (and their possible consequences on business goals) are continuously monitored and reported to decision-makers. The blackboard-oriented architecture of the platform defines several interfaces for the identified techniques, allowing new techniques to be plugged in.